So I’ve been a little tardy in writing this post…. 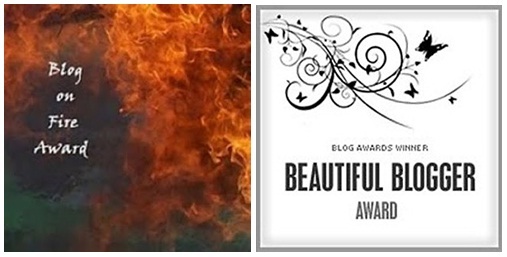 Last month the lovely Cara (gorgeous lady, author, craft shop owner, wife & doggie Mum) tagged me for a beautiful bloggers award! Then a week later I got tagged again by the delightful Carla Sue (joyful fellow Aussie, photographer, amazing baker…I get fat just looking at her blog!) for a blog on fire award. I’m definitely feeling the love (and a little greedy!) because Stephanie recently tagged me AND of course as a blogger I love the sound of my own voice (well, the clickity-clack of the keys of my own thoughts, but you know what I mean) so I’m more than happy to accept the love and pass it along! Blog reading is a little daisy chain that spans continents and encompasses people from all backgrounds and walks of life. I’m constantly amazed how you can find like-minded people all over the world! So if you’re down with what this lovely blogger award is about, you know the drill; I’ll tell you (another) seven things about myself and then tag other bloggers whose thoughts I enjoy so that we keep this circle of love going! I was born in the tropical North Queensland town of Townsville. My parents had me when they were 21 and we spent about six months there before moving onto a banana plantation up in Mission Beach where I would spend my toddler years running around the bush & beach naked with Indigenous Aussie kids. I am a nervous flyer. I actually try not to think about this particular fact because I like going places, but regardless, I panic a little during takeoff & landing and can’t stop myself playing crash scenes from Lost and Alive over & over in my mind. I put this down to my control freak tendencies. Some of my favourite things at the moment are; Ugg boots, Fifty Shades novels, split step lunges, Twinings peppermint tea, Country Road scarves & Saba knits, bright yellow wattle trees, black seedless grapes, Twigseeds cards & affirmations, Ben Howard, Chanel Vitalumiere makeup, MadMen, avocado & lime juice on rye for brekkie and rearranging my book shelf. When I get excited I start speaking really loud & quickly and I often clap my hands. Basically I am an 8 year old girl. I want to get two of my tattoos removed. Yes, I am a cliche of ‘why you shouldn’t get random tattoos when you’re drunk’. But the ones I got after careful & planned thought, I totally love. Luckily the two I want removed are small & inobtrusive, so it’s not critical. Just yet. Some people like chocolate. I like lollies (aka candy). I know how bad refined sugar is. I’ve read Sweet Poison and I can actually tell how hideous sugar is for me because I get super hyper and then I have an epic mood crash accompanied by a tortuous headache. So I’m constantly battling myself not to eat them when they’re in meetings at work (we get little bowls of Sherbies & Redskins in the client meeting rooms) and I avoid the confectionery aisle at the grocery store like the plague. It’s my Mother’s fault. She gave me her lolly-craving genetics. If I could choose a superhero power, it would be Technopathy like Micah from Heroes. Imagine being able to control & manipulate technology…Soooooo cool! A Hepburn in a Hilton World; I love the fashion, the pictures and the sentiment. The title says it all really! Transventure; a kickarse fitness journey by Andrew. It’s purely inspiring stuff. Round to Ravishing; like me, JoAnn blogs about all sorts of stuff including her journey to a kick arse body! I didn’t know you were a Townsville girl! And I don’t get the lolly / candy thing… am so a chocolate or nothing girl (and I hate jube-type lollies – snakes and jelly babies etc)! Lovely to learn some more about you! I’m a sugar addict too. I have tried breaking the addiction for the past few weeks and failed…badly! Thanks!! 🙂 I love the random tattooes, lol I don’t get how it’s even legal to tattoo drunk people !! I soberly wonder that too, but it was Kings Cross which seems to operate under laws of its own!! !